Now I understand what the “towel boy” reference is all about. After my first attempt at Towel Pull Ups failed, I was momentarily excited because I realized I had mistakenly grabbed the “hers” towel to do the exercise. 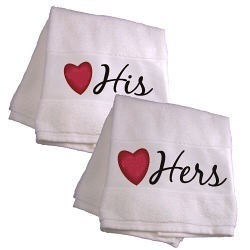 So, I promptly made the switch to the “his” towel. Unfortunately, this correction failed to yield the desired outcome. Despite my shortcomings, I liked this workout. It’s a new DVD to mix things up and a different group of people doing the various routines. They seemed more agreeable, in a human sort of way. Whatever. You start to form a relationship with the images on the screen as your brain struggles to form a bond and find some positive reason for what it’s being asked to do…. ARX today was hard. My quads were sore from–I guess–the tennis and prior ARX session on Sunday. I did it though, and that’s all that matters. 70 degrees and sunny in Atlanta today. The pollen is in the air! This entry was posted in P90X, Round 1 and tagged Ab Ripper X, Back & Biceps, P90X, Pull Ups, Towel Boy. Bookmark the permalink.